Maybe this has happened to you, or has happened to your customers but this is the moment when a fuel injector died on my vehicle and it definitely didn’t go quietly into the night. 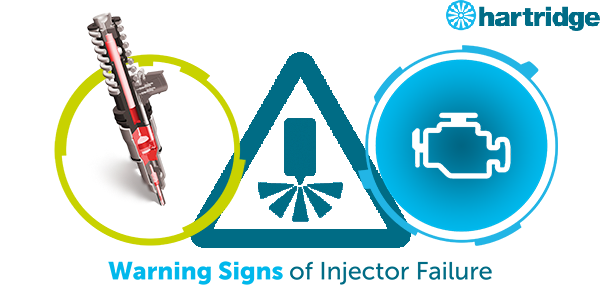 There are typical causes of the failure such as excess wear, abrasion, or internal defect within the injector. There are also symptoms the vehicle presents which are warning signs of what’s going on under the gasket and these are things you can help your customers can look out for. You don’t have to be a trained technician to understand that a change in a vehicle’s emissions is indicative of a change within the engine so this is an easy sign to encourage your customers to look out for. Often the area of the vehicle around the exhaust can be quite dirty even if they haven’t been able to see it while driving. It is important to pay attention to the timeline of this change i.e. was it practically over night or been increasing gradually? The colour of the smoke is also important because it also points to different causes. The customer can easily report to you whether the smoke is white or black, or grey which informs you whether there is too much oil or too much fuel in the combustion process. It is possible that black smoke can indicate that there is a DPF fault on the vehicle and that material is now exiting through the exhaust rather than being trapped in the filter. However this is obviously worthy of investigation itself so is still beneficial for the customer to keep an eye out for this. 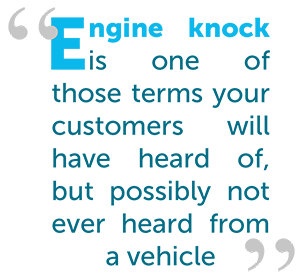 Engine knock is one of those terms that your customers will have heard of but possibly not physically heard it coming from a vehicle and are unsure of what it is an indicator of if they did hear it. This is such a critical warning sign that this is easy to encourage your customers to report the vehicle into the workshop as soon as this happens. Engine knock results from the miss-timing of the combustion process between the injector firing and piston movement, resulting in a knocking sound from the engine. This symptom indicates that more components than just the injector are now involved. The common rail pump could be contributing to the fault. Control units could also be faulty or trying to make sense of false positive measurements from a faulty injector. This is a harder sign to look out for because if it increases very gradually over time it can be very hard for the driver to tell the difference between how it used to run and now. The customer can look out for a deeper, gravely engine sound, engine chugging, the whole vehicle might have a slight shake or vibration. One of the best windows of opportunity for the driver to assess how the vehicle behaves is on a cold start. If the engine is hard to start it can be a sign that the fuel delivery is wrong or the timing is poor. Unstable RPM can also be a sign of an engine struggling on with incorrect fuel supply. A significant drop in fuel efficiency can often go hand in hand with rough running if the high pressure delivery is beginning to fail and can be an easier signal for your customer to monitor. The customer’s preventative maintenance is crucial to keeping these finely tuned processes in good working order. Excellent fuel and oil quality are essentially, as well as changing the fuel filter in a timely manner. If the vehicle does go into the workshop it is also possible to identify which injectors are faulty and exactly what is going on with its internal mechanisms. There are many symptoms that can be spotted on a vehicle before complete injector failure and dreaded limp mode transpires, so educating customers and fleet or vehicle owners is a must. Here we have provided a download and keep guide on these warning signs of injector failure.